When most people hear the word "invest", they probably think of heaps of money or of incomprehensible terms and impossibly complicated tax laws, of financial advisers and grim-faced accountants. Somehow, I had the idea that only the financially solvent could afford to put their money to work for them making more money. The "somehow" is easy to figure out. For generations, my folk have known how to find or make employment, how to work hard, how to live simply and frugally, how to save "for a rainy day". Never in my life had I heard the word "invest". At least not in any practical way. But when I realized my savings account earned a fraction of a percent interest, I decided to explore the world in "investing". I was lost. When I'd read about goals of hundreds of thousands of dollars in my retirement account, I gasped. Then I laughed. Not only were the numbers unrealistic, the terms were like a foreign language I'd never been exposed to, without a handy cognate or two as clues. And then, too, it was too late. For most of my life, "financial solvency" meant I had the bills paid, the refrigerator stocked, and the kids in shoes. "Saving" was for a special purchase, shutters for the house, for example. But as soon as I tried to build a cushion, a back-up in case of an emergency, said emergency showed up early and brought its cousins. The water heater blew and took out the furnace. Okay, okay, that didn't really happen, but it seemed like emergencies liked to cluster up. I should add that, by the grace of God, the emergency seemed to match my savings exactly. If I had $70, I needed just that. Same with windfalls. If I unexpectedly received a check for $300, it arrived with an unexpected bill for $299. So it was late in the game that I started to think about investing. But I didn't have much to work with. No reputable financial adviser would have wasted tepid coffee in a chipped mug on me. I was on my own. So I started researching, mostly on the internet, but also in books and magazine articles. And quite typically, I got distracted. Instead of learning ways to invest money, I found myself reading of the many ways I might give it away. But I was already good at that. I delighted in donating to World Ark, cancer research, the Humane Society, and such. I was thrilled to read about Global Water, an initiative that teaches people in developing nations how to seek underground water sources, how to dig and maintain deep wells. From there, I discovered Charitywatch.org that evaluates all the charitable organizations. I even prompted Global Water to apply for the vetting process to raise awareness of their work. I'm pretty sure that scrolling through Charitywatch is how I first learned about Kiva.org. And fell in love. "We are a non-profit organization with a mission to connect people through lending to alleviate poverty. 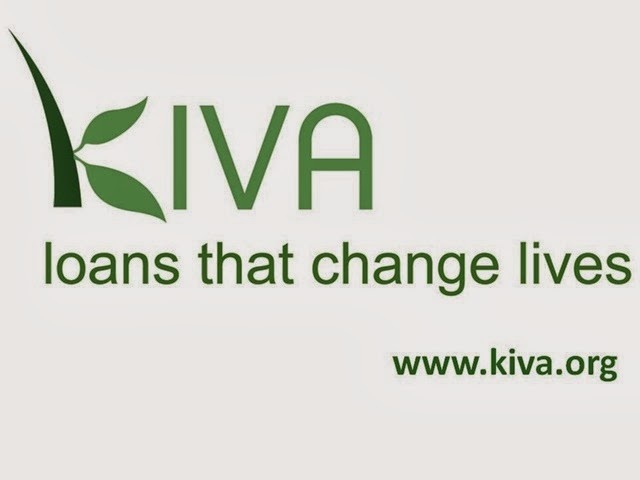 Leveraging the internet and a worldwide network of microfinance institutions, Kiva lets individuals lend as little as $25 to help create opportunity around the world." There it was: an investment in other people. Interest earned on promoting self-reliance. Becoming successful by investing in the success of others. And the beauty of it all is that my measly $25 that will buy me about half a tank of gas, is a significant hand up to someone who is building their own small business. Kiva.org's website is beautifully organized and easy to use. One of the features I like best is being able to sort borrowers by whatever criteria I choose. For example: because I am a woman, I tend to invest in the work of women; because I am a foodie, I tend to invest in food-related endeavors like agriculture, groceries, restaurants; because I was born in Panama, I tend to invest in Central American borrowers; because my beloved sister-in-law is from the Philippines, I also favor borrowers from there. In increments of $25, I am also promoting capitalism and pride in accomplishment. It fascinates me how quickly these loans get re-paid, too. And when they are, Kiva promptly notifies me. Then I have a choice to let it ride (but why? ), withdraw my investment with its interest, or re-invest. I re-invest ASAP. So far, I have invested in people buying seed, livestock, resale stock for their shops, delivery vehicle repairs, and a new roof or two to say nothing of a sewing machine for a woman who was making clothing to sell. Kiva.org has tabs in which I can check the repayment schedules, my net earnings, and so forth. And they offer specials, too. This past Christmas they offered a three-for deal: buy two gift cards, get one loan free. I took advantage of that, giving people I cared about an opportunity to experience what I started calling a "sacred rush", the joy of helping others even as I help myself. Please consider taking a few minutes to check out Kiva.org. I sincerely pray you get hooked, too. I can't think of a better blessing than to be a blessing to someone else. Molleen Zwiker is the author of five books, including her most recent: UNRELIABLE: A Novel of Suspense. She is is retired (but not from writing) and in the process of relocating from Michigan to Florida to be nearer her family.